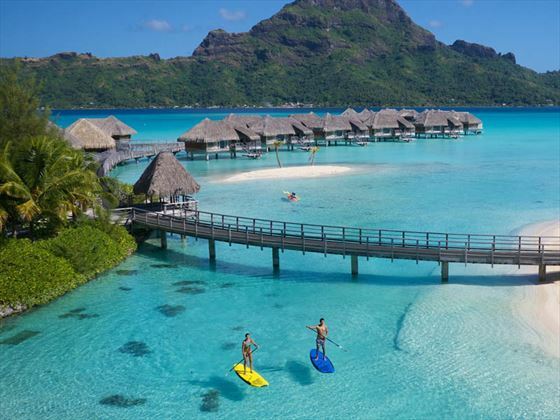 Located on the emerald green jewel of Motu Piti Aau – one of Bora Bora’s tiny islets – the InterContinental Bora Bora Resort is as remote as it gets. 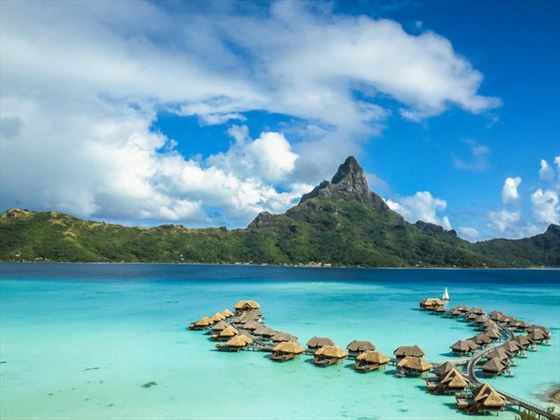 Surrounded by azure lagoon and looking out onto the regal Mount Otemanu, this resort offers eco-luxury and a chance to truly unwind in paradise. 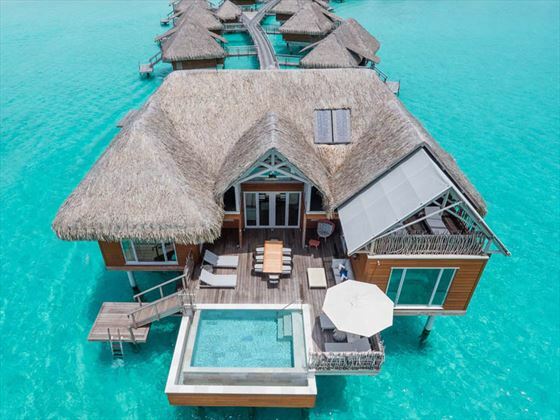 Whilst all other Bora Bora properties have just a small collection of overwater villas and the rest on the beach, this particular oasis solely offers villas that jut out over the translucent lagoon. Relax on your private deck with steps that sink down into the water, or book one of the Pool Villas for your own little plunge pool to relax in. Every villa has a charming living area with a glass coffee table that looks down into the crystal-clear lagoon below. Peel yourself away from your stunning villa, and you’ll find that this resort offers an array of wonderful activities. Wander along to the Lagoonarium to marvel at over 200 species of marine life, or head down to the Beach Boy’s traditional Polynesian demonstrations to learn how to weave your own crown from coconut fronds. The topaz blue waters are ever so enticing, so we’re certain you’ll love spending your afternoons paddle boarding, fishing and snorkelling. As the sun starts to set, you’ll have a great range of restaurants to try. Dine with your toes in the sand at Sands Restaurant, try a taste of Polynesian fare at Reef Restaurant, or indulge in a romantic meal for two at Le Corail Restaurant. Fancy something away from the norm? The canoe breakfast is a unique way to start your day. 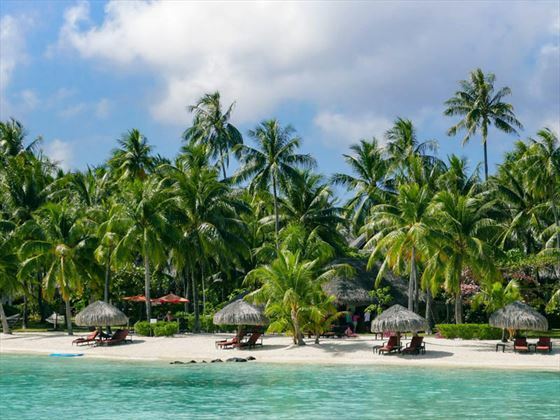 A 50 minute short and visually stunning flight from Papeete (the main airport on Tahiti) and then a 20 minute boat ride takes you across to the resort. Each of the 84 villas offers direct access to the lagoon from a split-level sundeck, which also has a freshwater shower. All room categories offer the same style, but the views differ depending how far you are along the wooden walkway. 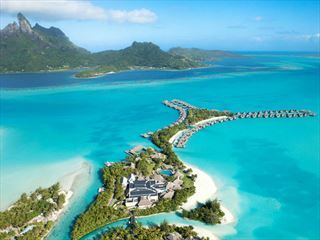 Emerald Overwater Villas -These are closest to the main resort area and enjoy views towards the beach. 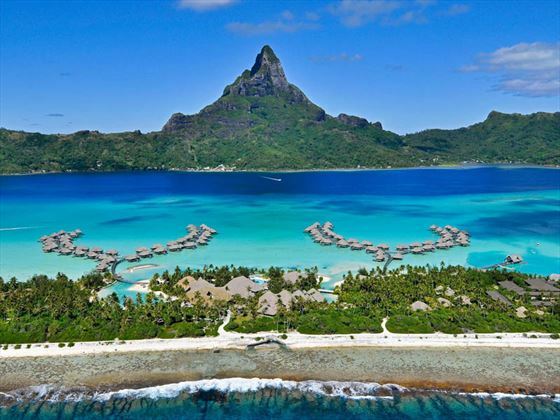 Diamond Overwater Villas - These offer awe-inspiring views across the turquoise lagoon to Bora Bora’s main island. 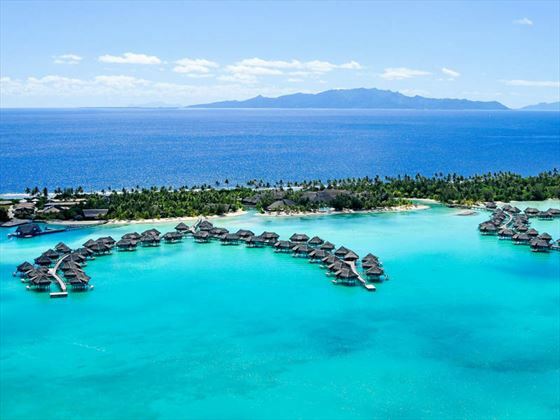 Diamond Otemanu Overwater Villa - For truly amazing vistas of the lagoon and Bora Bora's dramatic peak, Mount Otemanu, go for these villas. A handful of villas also feature a private pool on the deck for an added sense of luxury and indulgence. 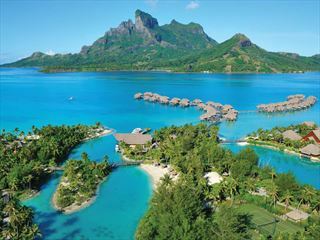 Le Corail - For romantics and true foodies, this is arguably one of Bora Bora's finest restaurants. With the largest wine cellar in French Polynesia and an astonishing attention to detail, the French inspired cuisine is simply stunning. Sands Restaurant - The resort's beachfront restaurant, with a real variety of foods including salads (a rare treat on holiday). The restaurant offers great cocktails and live music as well as regular bbqs. There are a range of complimentary watersports aswell as other water activities for a small charge. The Spa is one of the very best, with three spa suites sitting over the turquoise lagoon with glass bottom floors.